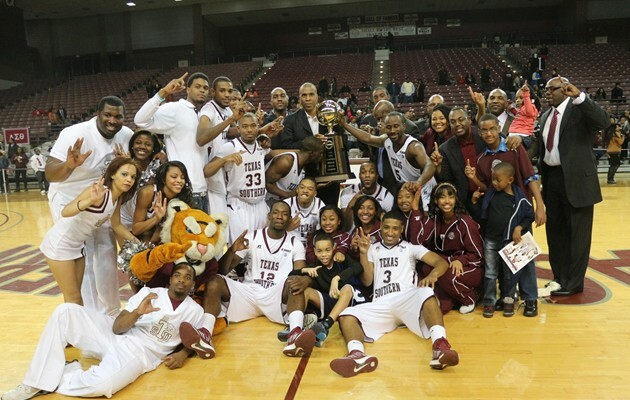 HOUSTON – History was made on Saturday night at the H&PE Arena as Texas Southern clinched the 2013 Southwestern Athletic Conference regular season championship and said goodbye to four seniors on the Tigers basketball team. Dexter Ellington, Kyrie Sutton, Fred Sturdivant and Omar Strong concluded their collegiate careers in grand fashion helping Texas Southern to its first SWAC regular season title since the 2010-11 season. The Tigers dominated from start to finish as they led 39-27 at halftime before going on to outscore Alcorn State 39-32 in the second half of play. Texas Southern built their largest lead of the second half at the 16:15 mark on a Sturdivant jumper that brought the score to 49-28. Alcorn State cut the lead to twelve points at 67-55 with 4:18 left to play but the Tigers pushed their advantage back to 21 points with 1:30 remaining on a Sturdivant dunk (76-55). Sturdivant led all Texas Southern point contributors with 24 points on a 9-of-13 shooting night of the floor. He also grabbed 6 rebounds while blocking 5 shot attempts and set the tone early in the contest with his energy level. Strong finished the game with 18 points going 7-of-12 from the field and 4-of-8 from beyond the arc. Strong became the All-time leader in school history with 222 successful three point attempts in his two year career as a member of the Tigers program. Texas Southern outrebounded Alcorn State 37-to-33 while scoring 29 points inside the paint to the Braves 26 points. TSU held the Braves to no points in transition and forced ASU into shooting just 39 percent from the field (23-59). The Tigers have concluded their season with a 17-14 overall record and a 16-2 mark in league play. Texas Southern ended the season on a twelve game winning streak. The Tigers led the SWAC in league play in several statistical categories including scoring offense, scoring margin, field goal percentage, three point field goal percentage, rebounding defense, assists, and blocked shots. Strong finished third in points per game in the conference (17.1 ppg), while fellow teammate Sturdivant finished first in blocked shots (3.4 bpg), and second in rebounds (3.4 rpg). Ray Penn led the conference in assists per game (5.9 apg) and also ranked first in assists to turnover ratio. Texas Southern concluded SWAC regular season play with a 7-2 record on the road. Texas Southern went undefeated at home in conference play at 9-0. Fred Sturdivant tallied six blocked shots against Southern and five versus Alcorn State. The Tigers had two players score in double figures against Alcorn State. Texas Southern led the Southwestern Athletic Conference in points scored per game this season. Omar Strong became the school’s All-Time leader in three point field goals made (222). Texas Southern has the sixth longest current winning streak in the NCAA (12).